May Allah be pleased with you and make Heaven your home and resting place, with God’s mercy and blessings. O intimate of Allah, Stand by us when Allah sits in judgment over us. May Allah be pleased with you and make Jannat your home and resting place, with God’s mercy and blessings. Bibi Fatima Binte Hazam known as Ummul Baneen (SA) came into this world in the 5th year of Hijri. She was an accomplished and cultured lady known for her glory, honor, piety, and nobility. Later, she would have the honor of being the wife of Imam Ali (AS), and would be called mother by Imam Hasan (AS), Imam Hossain (AS), Bibi Zainab (SA), and Bibi Kulsom (SA). In her marriage with Imam Ali (AS), Bibi Ummul Baneen (SA) bore four sons: Hazrat Abbas (AS), Hazrat Abdullah (AS), Hazrat Imran (AS), Hazrat Jafar (AS). They were brought up under the direct guidance and blessings of Imam Ali (AS). She inspired and educated her own children to act only as slaves to Hossain (AS). Bibi Umul Baneen's love for Imam Hossain (AS) was so intense that when she received the news about the martyrdom of her four children, she said: "Tell me about Hossain (AS)" and when she received the news of Imam Hossain (AS)'s martyrdom she said: "All of the arteries of my heart are torn. May all of my children and whatever that exist under this azure heaven be sacrificed for the sake of Imam Hossain (AS)". Ummul Banin (SA) gathered together a number of women of Madina in her house and all cried for the martyrdom of Imam Hossain (AS). This was the first ever Majlis conducted after the martyrdom of Imam Hossain (AS). A gifted poetess, she is considered as the first noha (lamentation poetry) reciter for the martyrdom of Imam Hossain (AS). The nohas recited by Bibi Ummul Baneen for the martyrdom of Imam Hossain (AS) are recorded in history and are considered as masterpieces in Arabic literature. 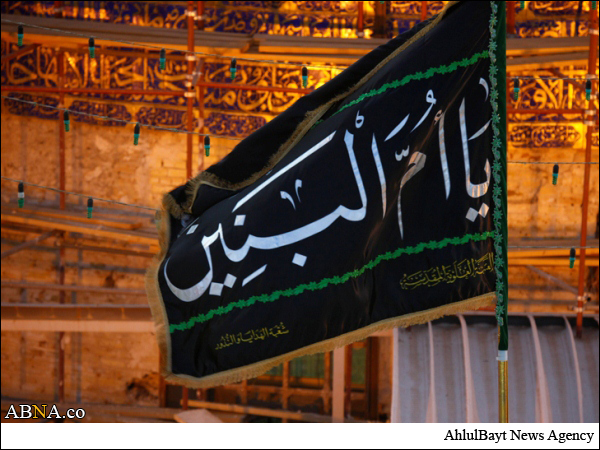 After the Battle of Karbala, Bibi Ummul Baneen (SA) became very weak as she was mourning for relentlessly. The grief was taking its toll and she finally left this world on the 13th Jamadi us-Sani 64 AH. 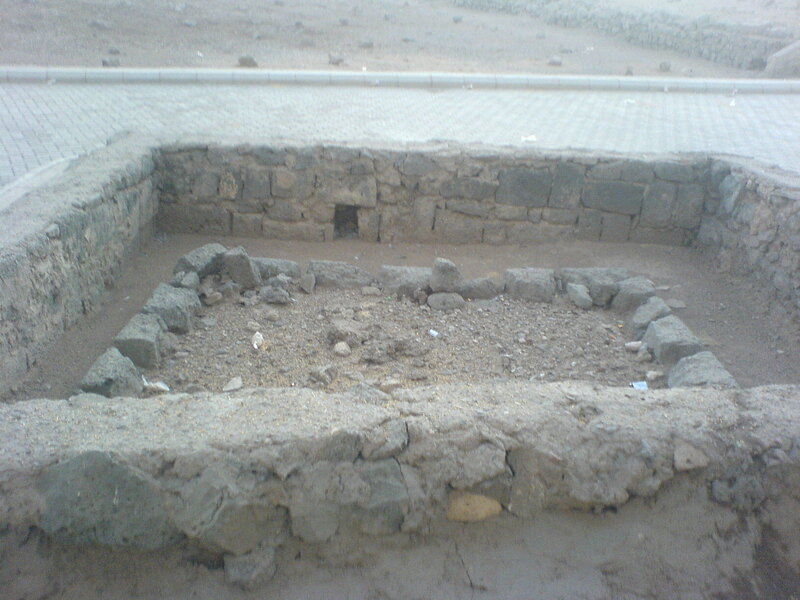 She is buried in Jannat al-Baqi. On the sad occassion of her death anniversary, we extend condolences to Prophet Mohammad(sawaw), Imam Zamana(a.s.), the Ahl-e-Bait(a.s.) and to all Momineen and Mominaat. Hazrat Fatima binte Hizam bin Khalid Ibn-e-Rabi'e Ibn-e-Amer Kalbi belonged to the clan of Banu Kilah, which was one the noblest families amongst the Hashimites and famous for the bravery and valour of its warriors. She was born in 5 A.H. Some years after the martyrdom of lady Fatima Zahra(s.a.), Imam Ali(a.s.) expressed his desire to his brother Aqil bin Abi Talib(a.s.) to marry a women of a brave and warrior tribe. Hazrat Aqeel was a very knowledgeable in tribe genealogy and he immediately proposed the name of Hazrat Fatima binte Hazam bin Khalid and the marriage took place soon after. Much earlier during 8 A.H., Imam Ali(a.s.) had been given the prophecy by Prophet Mohammad(sawaw) of a brave son who would be martyred alongside with his brother Imam Hussain(a.s.) on the day of Ashura. Ever since then, Imam Ali(a.s.) had been waiting for the birth of that son which came in the person of Hazrat Abbas(a.s.). Hazrat Umm-ul-Baneen came to the house of Imam Ali(a.s.) knowing very well that before her the chief of the women of paradise, Hazrat Fatima Zahra(s.a.) was living in that house. She served Imam Ali(a.s.) in the same manner as Hazrat Umm-e-Salma had served the Holy Prophet(saw) after the demise of Hazrat Khadija(a.s.). Immediately stepping in the house, she vowed herself to act as a slave of the children of Hazrat Fatima(s.a.). Her sincerity was much respected by the children of Hazrat Fatima(s.a.) that they always gave her a high status and respect. Fatima Binte Hazam was an accomplished and cultured lady, and bore Hazrat Ali's four sons, Abbas, Abdullah, Jafer and Usman. The meaning of 'Ummul Baneen' is 'Mother of Sons'. All of her sons were martyred along with Imam Husain. After their martyrdom, she requested people not to call her 'Ummul Baneen' ever again. When Imam Husain(A.S.) was leaving Madinah for Iraq , Ummul Baneen asked her four sons, Hadrat Abbas(A.S.), Abdulla, Ja'far and Usman to sacrifice their lives in the sacred cause of Imam Husain(A.S.). On 10th Muharram 61 A.H.,the day of martyrdom of Imam Husain(a.s.) and his 72 faithful companions at the battlefield of Karbala when Hadrat Umme Salamah witnessed that the earth in the bottle given to her by the Holy Prophet(sawaw) had turned into blood she raised the cry of "Ya Husain" Ya Husain" and declared that Imam Hussain(a.s.) has been martyred according to the prophecy foretold to her by the Holy Prophet(saw) about the martyrdom of Imam Hussain(a.s.). Then Ummul Baneen gathered women of Madinah in her house and all cried for the martyrdom of Imam Hussain(a.s.).This was the first ever Majlis conducted after the martyrdom of Imam Husain(a.s.).Ummul Baneen had such sincerity toward the Holy Prophet's progeny that she loved Imam Hussain(a.s.) more than her own children. A feeling which was from the bottom of her heart. It was to the extent that when she received the news stating the martyrdom of her four children, she said: "Tell me about Hussain (A.S.)" and when she received the news of Imam Hussain (A.S.)'s martyrdom she said: "All of the arteries of my heart are torn. May all of my children and what ever that exists under this azure heaven be sacrificed for the sake of Imam Hussain (a.s.). She loved the Children of Fatimah Zahra(sa), daughter of Mohammed the messenger of God, from her heart. She requested her husband Ali Ibn-e Abee Talib, not to call her Fatimah after her marriage to him, partly because of sanctity she bore for Fatima al-Zehra, and partly because it evoked the grief in the hearts of children of Bibi Fatema al-Zehra.She inspired and educated her own children to understand the fact, that they were slaves to Imam Hussain. Her sons never claimed to be brothers of Husain, rather claimed to be his slaves, as their mother wished. She died at the youthful age of 59 lunar years in year 64 AH. She was the first one to hold a congregation [Majlis] for Imam Husain bin Ali right after his martyrdom. She was a poetess, and wrote the first latmiyyah in his honour. After the arrival of Imam Sajjad(a.s.) and Hazrat Zainab(s.a.) in Madinah Hadrat Ummul Baneen used to gather women in her house and used to narrate them how Imam Husain(a.s.) and his companions were martyred by Yazidi forces. 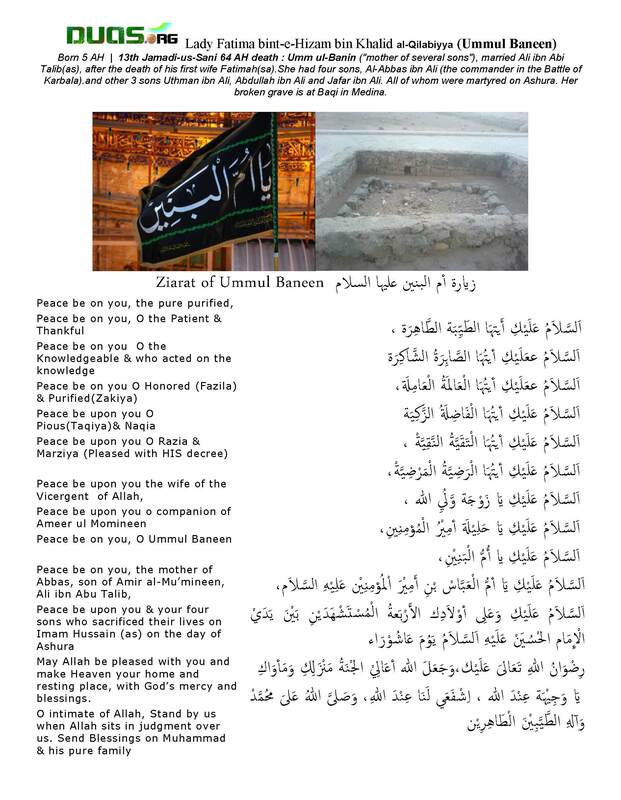 Hadrat Ummul Baneen was a great poet and she is considered as the first Noha (lamentation poetry) reciter for the martyrdom of Imam Husain(a.s.).She used to visit regularly the famous Jannat al-Baqi cemetery in Madinah and recite her Nohas in a very sad voice that everybody present there used to weep bitterly. 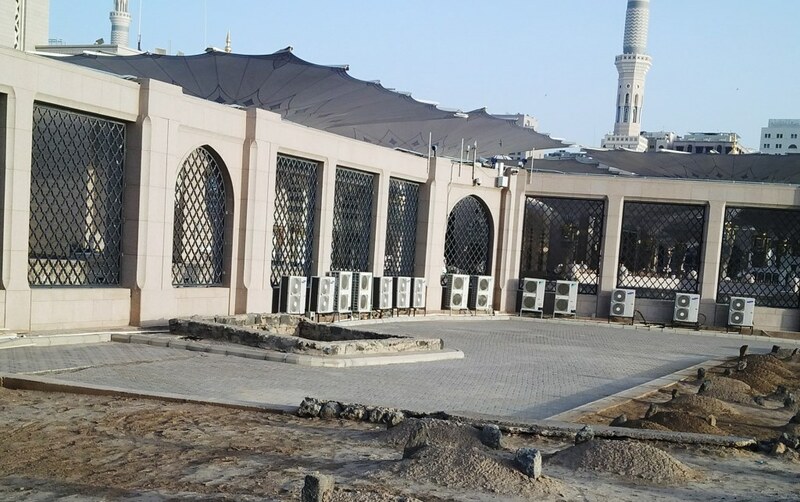 She transformed the Jannat al-Baqi cemetery in Madinah as "the Centre of Azadari of Imam Husain(a.s.)". The Nohas recited by Hadrat Ummul Baneen for the martyrdom of Imam Husian(a.s.) are recorded in history and are considered as masterpieces in Arabic literature. 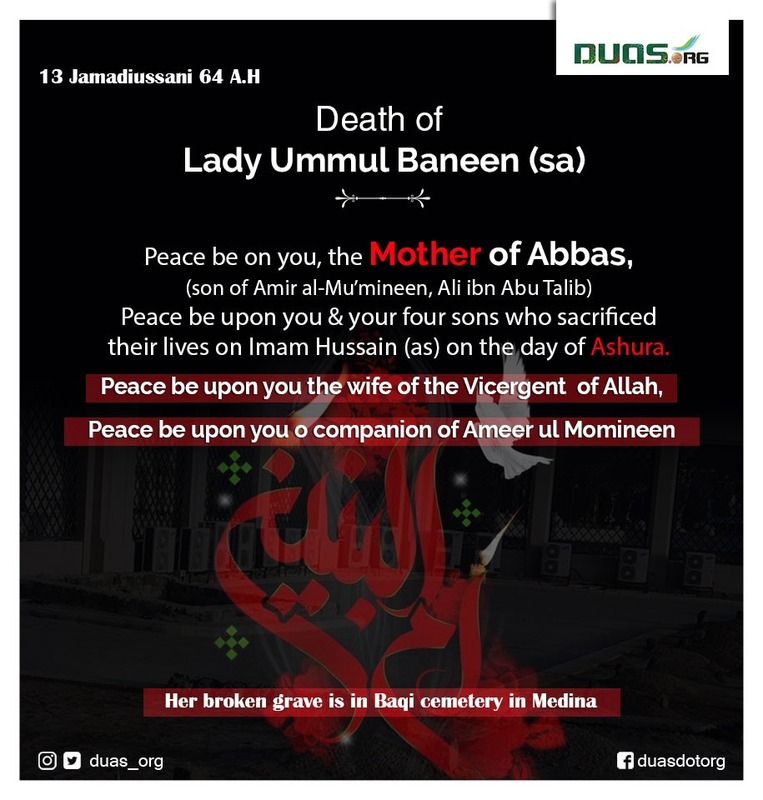 Lady Ummul Baneen died on 13th Jamadi us-Sani 64 A.H. and was buried in the Jannat al-Baqi cemetery in the holy city of Madinah. We pray for the early reappearance of the Awaited Saviour & restoration of the Grave into a masolueum .